Synthetic peptide derived from the C terminus of Human HEXB. Human brain cortex tissue; Jurkat cell extract. Our Abpromise guarantee covers the use of ab166791 in the following tested applications. WB 1/500 - 1/1000. Predicted molecular weight: 63 kDa. Defects in HEXB are the cause of GM2-gangliosidosis type 2 (GM2G2) [MIM:268800]; also known as Sandhoff disease. GM2-gangliosidosis is an autosomal recessive lysosomal storage disease marked by the accumulation of GM2 gangliosides in the neuronal cells. GM2G2 is clinically indistinguishable from GM2-gangliosidosis type 1, presenting startle reactions, early blindness, progressive motor and mental deterioration, macrocephaly and cherry-red spots on the macula. Belongs to the glycosyl hydrolase 20 family. N-linked glycans at Asn-142 and Asn-190 consist of Man(3)-GlcNAc(2) and Man(5 to 7)-GlcNAc(2), respectively. The beta-A and beta-B chains are produced by proteolytic processing of the precursor beta chain. 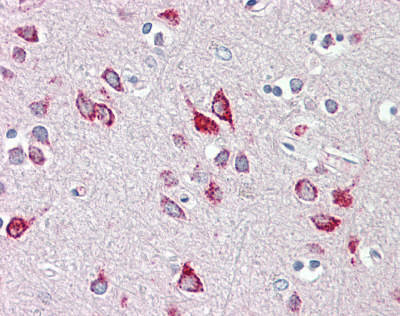 Immunohistochemical analysis of formalin-fixed, paraffin-embedded Human brain cortex tissue labeling HEXB with ab166791 at 5 µg/ml. ab166791 has not yet been referenced specifically in any publications. Publishing research using ab166791? Please let us know so that we can cite the reference in this datasheet. There are currently no Customer reviews or Questions for ab166791.